I'm participating in a board game competition for charity called the Gauntlet. This competition happens every year, and for the first time I'm in Paizo's four-person team to participate! I'm excited to be part of it, and particularly excited for the "vintage circus" theme they've picked for this year. Please consider contributing! My contribution page is thegauntlet2019.causevox.com/RonLundeen. Here's some advice about how to effectively bring a long-running campaign to a close. I've done this a few times, most recently in the several campaigns I was running before moving from Chicago to Seattle. So I've put down several points of advice for GMs doing the same. I also want to give a shout-out to Mark Seifter, whose excellent thoughts about preparing a final encounter will appear in the upcoming Pathfinder #144: Midwives to Death. I've talked before about how boxed text, or read-aloud text, is the most direct way an adventure author speaks to the players. This kind of text is great for setting a scene, relaying critical mission information, or focusing player attention on specific elements. However, there are a several things good boxed text shouldn't include. Here are my rules for what you shouldn't say in your boxed text. An important aspect of RPGs is their collaborative storytelling nature. The players are a key part of the storytelling, and if they don't get the story, that's a recipe for disappointment and missed opportunity. As a result, it's important to put as much information in the hands of the players as possible, particularly information about motivations and plans of the villains they face. Let's start with two quick lists: the first provides good traits to give a villain when you want to show they're villainous. The other list provides bad traits to give a villain when you want to show they're villainous. I've been thinking a lot recently about how to present encounters. Pathfinder and D&D do this very differently; here are a few examples showing what I mean. * The Pathfinder Method: Makes encounters very long in column-length; different sections and effects are set apart; aims to be comprehensive. Free Adventure: Against the Evil Keep! While the heroes are traveling through a narrow valley, they spot an evil keep. The massive fortress of dark stone is 35 feet across and nearly 50 feet tall. Flags hanging from iron spikes depict flames, gruesome beheadings, and other wickedness. Two massive iron ballistae are mounted atop the keep’s tall towers. Creature: If the heroes approach, the evil keep attacks! Adventure authors don't speak to players directly; the communications are filtered by the GM at the table. There are some obvious exceptions to this, such as boxed text meant to be read aloud to set a scene, but there are some secret ways an author can communicate tactics to savvy players. It's sort of like a hidden language. Much of it rests in how the adventure describes the enemies the players face. How Long is Your Adventure? My brother wrote a book. It's here, and it's really good. But this blog post isn't about shilling my brother's book; it's about being intentional about adventure length. When Robert was writing his book, he started with the seed of his story, but then he took a hard look at how long he wanted to take to tell the story. Final page count was something he had his eye on early in his process, and that struck me as similar to RPG adventure writing. You might have heard that we in the Pacific Northwest have been buried under a surprising amount of snow. That got me thinking about how most RPG adventures assume good weather (or at least no weather of note), but the reality is we sometimes experience downright bad weather. That's something to keep in mind during your adventures, whether you're running them or writing them. From a narrative perspective, weather can often help set the mood. My adventure for Legendary Games, The Horseshoe Calamity, just received a four-star review from epic reviewer Endzeitgeist. Check it out right here. Let's talk about words to avoid in your game writing (and, as a bonus near the end, what not to kill). These words and phrases generally produce weaker writing, so doing a find-and-replace for them prior to turning in a project makes the whole thing stronger. It also cuts a surprising number of words, if you find yourself over wordcount. No author writes an RPG adventure or supplement in a vacuum. Resources are key to creating good, compelling adventures, and here are some of the most important on-line resources I use. I’m afraid I once deterred my younger brother from playing D&D by explaining it as “a game about doing math and waiting your turn.” But I’m not wrong. Taking turns is important in most RPGs, particularly in combat, and there are as many methods of doing so as there are RPGs. Here are some common ones, and a few observations about each. Several blogs spend the first post of the new year recapping the previous year. That’s not the kind of recap that I’m talking about here. I’m talking about adventure recaps! I've seen the movie O Brother, Where Art Thou? more times than I can count. I've rewatched the first season of The Good Place three times in the past six months. I played through each of Mass Effect and Knights of the Old Republic at least twice. I know plenty of people who can recite huge sections of Star Wars by heart, or entire comedians' monologues--because they've seen them so often. 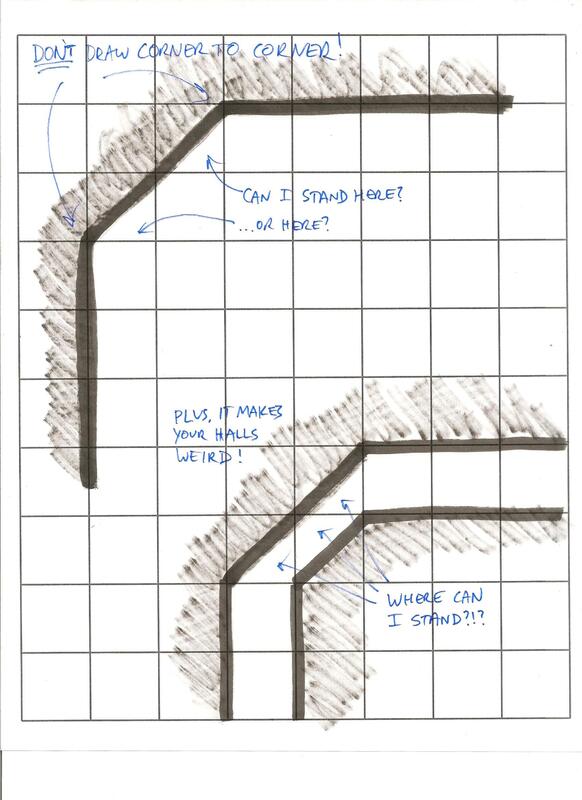 I have an image blog post today: how to draw angled walls for your dungeons. There's a common way that poses some problems, and a better way that makes a lot of things more clear. 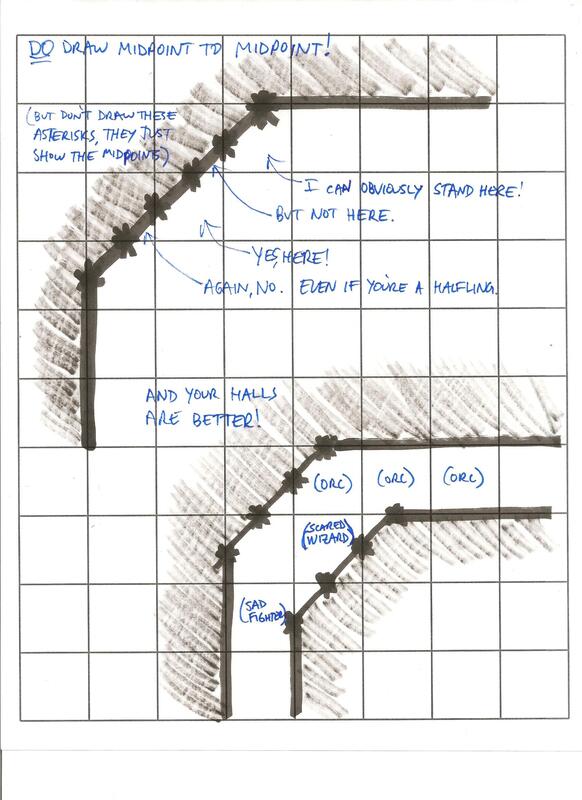 The images show this, but the key is this: draw angled walls from the midpoints of squares, not the corners. Players really like sandbox adventures. The term "sandbox adventure" implies an adventure (or even campaign) in which the characters are free to go wherever they'd like, and address adventure elements in whatever order they choose. There's a real sense of player agency there, and that's one of the reasons they're so popular. They also seem more realistic, as the players know there's something going on all over, and not just waiting for their interaction, just like in the real world. I've had a general frame of mind when writing that I used when writing papers in graduate school, when writing memos as a lawyer, and in writing adventures. It's a fairly simple way of viewing a writing project, and I wanted to speak about it in reference to adventure writing. Your adventure is a skeleton, or it's a zombie. A classic, old-school dungeon is a series of connected rooms, each containing traps or monsters. This is fun, but modern RPG players expect more verisimilitude from dungeon inhabitants. If there’s an ogre in one room and a roper in the next, a lot of questions naturally arise: do they know about each other? Do they get along? Will one come running if the other cries out for help when outmatched by intrepid adventurers? I Found a Secret Monster! There's a very good piece of adventure design advice that goes like this: you must leave at least 3 clues for something you want the PCs to do. As they could miss one, or even two, of these clues, you need to have enough there to point the PCs in the right direction. I wanted to talk about why this rule works, and give some advice about putting it in action.